Every image you see on computer consists of number of pixels. In 3D objects however, this is represents by Voxel (volumetric pixel), square block or cube in all 3 dimensions. It is possible to create 3D characters from 2D images using online 3D constructor. To make it simpler, think of Minesweeper where you build an object block by block. In similar way, you can create 3D model by defining object in different views. If you are an Engineering student, you surely remember Orthographic and Isometric projections. 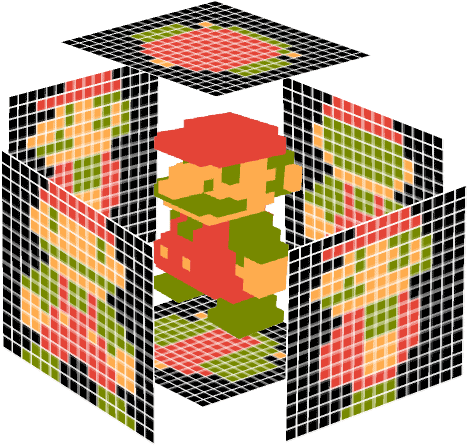 What if you create various views of a object in orthographic projection pixel by pixel and get the outcome as 3D object. Given a collection of images of an unknown static object under known viewing configurations and lighting conditions, reconstruct the 3D object. Go to VoxelSpirit 3D Shape Builder by 0fps. On the interface of this editor, you have to define various views of an object such as top, bottom, left, right, etc. on the left side. It has to be done pixel by pixel and various colors can be used for that. Once completed, you can reconstruct selected views to get the 3D object output which appears in middle of screen. Editor is similar to the Sweet Home 3D which was used to build and design home interiors in 3D. If you want, you can order a real world object/model of your creation by ordering it to be printed in 3D. Also, check out some of the creations by other users which are available for sale at their shop. The aim of this DIY tool is to create real world 3D characters and not animated 3D avatars for virtual applications. Where your readers goes off? In a widget in footer. Nowhere. They are there itself.